Tottenham moved a step closer to playing home games at Wembley next season after Brent Council approved their planning application. The club's bid to host 27 matches at the stadium's full 90,000 capacity was approved by a majority of five to one. Local residents were given a chance to air their views at the meeting, which lasted three hours and 32 minutes. Spurs now have until 31 March to activate their option to play at the national stadium. 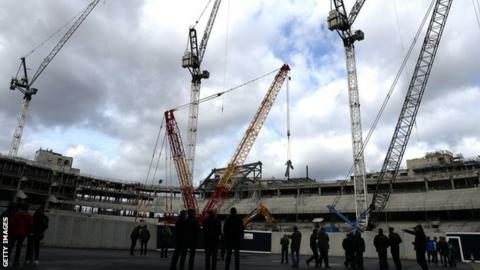 The club, however, are likely to use all their available time to decide, as they assess whether their new stadium next to White Hart Lane will be completed in time for the start of the 2018-19 season. Tottenham could yet stay at their current ground next season and aim to play home games at Wembley in 2018-19, before moving into the new stadium for the 2019-20 campaign.